This free shipping policy on our nearly 1,300 online items, including all publishers and 3D printers, is just one way Media Supply is helping our customers save money. 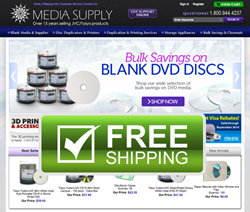 Media Supply, Inc., a leading supplier of CD and DVD duplication services, supplies and equipment, announced an expansion of its free shipping program on MediaSupply.com. Complimentary ground shipping is now available with the purchase of every product listed on MediaSupply.com, including blank recording media, automated disc publishers and 3D printers. With this new and expanded complimentary shipping program, Media Supply has eliminated confusing shipping charge calculations, adding convenience and bringing big savings to MediaSupply.com shoppers. Media Supply of Exton, Pennsylvania specializes in premium recordable discs, duplication systems, data storage devices and 3D printers. Through high-level customer support, premium products and fast order processing, Media Supply has become an established leader in the data storage industry. Media Supply’s new complimentary shipping policy improves the customer experience, eliminating the calculations and complications of shipping fees. Media Supply ships items via standard ground shipping and delivery to customers’ doors happens within 3-6 business days after the order is processed. As an added convenience, MediaSupply.com will continue to offer competitive values for expedited home delivery. More information is available at MediaSupply.com. Media Supply, Inc. offers duplication equipment, consumables, services and fulfillment, designed to meet the requirements of those wishing to distribute products and information in data, audio or video form. The company's key products and services are DVD, CD & Blu-ray Disc™ publishers, USB duplicators, duplication and fulfillment Services and premium duplication supplies. Media Supply is headquartered in Exton, Pennsylvania. For more information, visit their website at http://www.mediasupply.com or call 1.800.944.4237.